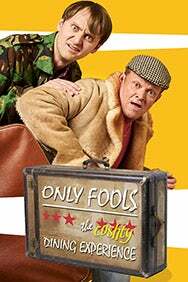 We do not curently have theatre tickets available for Only Fools, The (cushty) Dining Experience This could be because we have simply sold out or it could be that this show is no longer running. The information on this page remains purely for historical and informational purposes. It’s the show you’ve all been asking for  and it’s brought to you by the people behind the worldwide smash hit, Faulty Towers The Dining Experience. A t’riffic night out with some cushty pub grub, this is a night you won’t forget  and you’d be a plonker to miss it!